A training course for young people on solidarity in Europe. The training course “Looking for a Brighter Future! 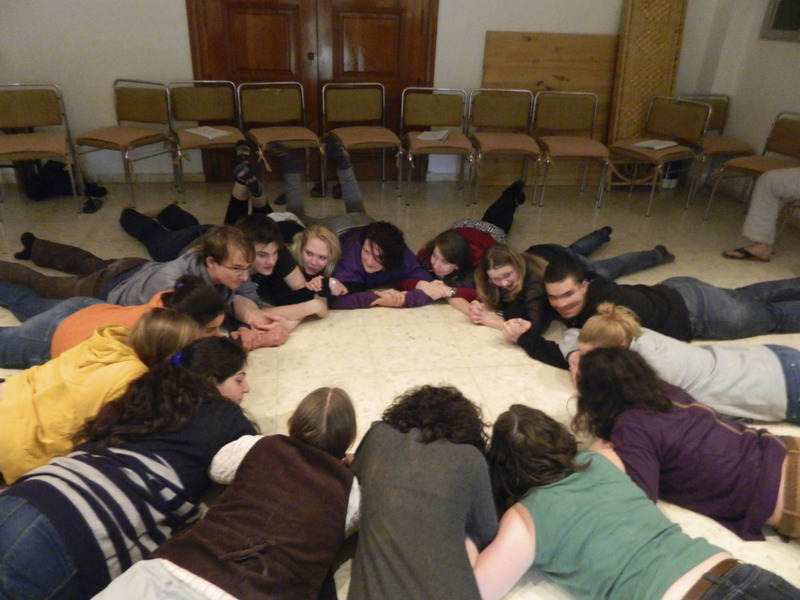 A training course for young people on solidarity in Europe” took place in Ecumenical Centre Los Rubios in Malaga, Spain from 19/01/2014 – 26/01/2014. It brought together 31 participants, team members and experts. The participants came from 17 different countries, among them Georgia and Lebanon. There were 20 female and 11 male participants. In addition to Christian participants, there were also two participants from a Jewish background which enriched the group and the discussions. The diversity of the geographic, social etc. backgrounds of the participants ensured an intensive discussion and exchange. The training course aimed at strengthening solidarity among people of all ages, promoting equal rights of different age groups, as well as enhancing active participation of young people in tackling current socio-economic challenges. to equip participants with concrete tools for promoting economically responsible and sustainable solutions in their own context. The main methodology of the training course was non-formal education, and participants experienced a programme full of interesting and interactive processes and activities. The programme of the training course was split in 5 different areas. At the beginning of the week, the programme was focusing on exploring concepts of solidarity in Christian and other traditions, thanks to a Bible study, a biblical theatre session and the lecture from Rev. Juris Calitis from Latvia. It was followed by giving participants some information about the economic and financial crisis and the most vulnerable social groups, introduced by the second guest-speaker Dr. Jurgen Born from Germany. Then, participants had the opportunity to experience the current socio-economic situation in Europe through sharing information about their home context, experiencing a role play and by visiting a local organisation Lux Mundi Ecumenical Centre. This visit was organised in order to provide participants with a good practice example and stimulate them to take practical initiatives. The following parts of the training course were more practical. The participants were offered several practical workshops to present tools to be used in their home context, thus further strengthening the skills and knowledge of the participants. Several different tools were explored: advocacy (offered by expert Ms. Asa Gunven from Sweden), working with youth groups, conflict communication, project management, a movie study and the best practices examples study. This was followed by an opportunity to put in practice and in context what they have learned by organising an awareness raising activity to promote solidarity in Malaga city centre. The participants also got involved in the work of Lux Mundi (exchange of languages and soup kitchen). The participants contributed actively to the process of the training course with their personal experiences, knowledge on the subject and open-mindedness. They really enriched the atmosphere of the event with their creative approaches to the activities. Being the first thematic event of the year, this training course was the opening point for the thematic work throughout the year. Initially it was planned to focus the event on intergenerational solidarity, however the IPC and the participants lead it the way, that solidarity in general was strongly highlighted. This way the training course prepared ground for the all consequent activities by dedicating quite significant amount of time to the general concept of solidarity. Besides that, exploration of the view of disadvantaged age groups and mechanisms behind economic crisis were important inputs for the launch of the campaign “Break the Chains!” and the training course in Sofia, which took place in May 2014. Next to the programmatic contribution, the event also gained many enthusiastic followers for EYCE and its campaign. Some of the participants afterwards joined the pool of Active Campaign Supporters and will help to promote the Break the Chains campaign on local level. With this training course the vulnerable groups in general were discussed, not only the issues and problems related to young people. Even it gives more broad focus to the discussion, on the other hand, again it highlights the message of solidarity – being young people we not only care about other young people, but about everyone who is suffering form poverty and exclusion. In addition, it provided a good insight in the processes taking place in society today, which was also useful for the coming activities, especially campaign, as one of the members of the Campaign Coordination Team (CCT) participated in the training course and could bring back the input and ideas.